Classical to Bollywood – Combining strengths of two seasoned performers, Mehnaz Hoosein and Andrew McLean form an electric collaboration illustrating both the deep roots of India’s classical traditions as well as the contageous diversity in India’s popular music repertoire. A typical performance interweaves chapters in tabla drums, 25-stringed sarodes, vocal and dance music. The cultural traditions of India offer unique and beautiful ways to help students connect with a variety of educational themes including math, language, I.T., contemplation, elaborate decoration and the integration of diversity. Covering several genres in one presentation, Musical Diversity in India illustrates how the region’s contemporary pop/film music and the classical traditions share origins in the ancient reverence for sacred sound. Small ensembles featuring traditional Tabla drums, vocals and Sarode music will illustrate common threads and unique characteristics of several Indian music genres including both Bollywood and Hindustani classical traditions. Creative activities can include meditative listening & some structural analysis as well as popular group dance moves and sing-alongs. Clean carpet on a riser or presentable floor space and an adequate sound system for the selected performance space. Artists can provide riser &/or sound system for an extra fee. Modern Music in India illustrates how India’s modern pop/film music and its’ contemporary classical-based traditions revise creative boundaries in modern contexts while sharing origins in the ancient reverence for sacred sound. Integrating trendy dance genres and performed or sequenced soundscapes from the venerated classical traditions, Mehnaz Hoosein and Andrew McLean illustrate modern creative platforms common to several Indian music genres including both Bollywood and Hindustani classical traditions. 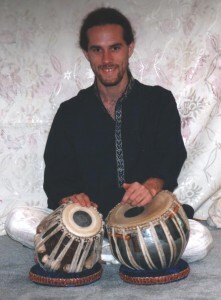 This program features Tabla drums and vocals. Creative activities can include simple composition, some technological analysis as well as popular group dance moves and sing-alongs. Adequate sound system for the selected performance space. Artists can provide sound system for an extra fee. The Classical Music of North India program introduces the rich melodic and rhythmic structures of North Indian classical music in an entertaining yet educational format. Featuring exquisite instruments like the tabla, sarode and sitar, students are engaged with creative sound play using word and note combinations. The Classical Music of India program introduces the rich melodic and rhythmic structures of North Indian (Hindustani) classical music in an entertaining yet educational format. Introductory performances precede themed breakdowns which illustrate various themes with both vocals and instruments including the tuned tabla drums, and the exotic, multi-stringed instruments like the sitar, sarode or sarangi. Each program involves the students using creative aspects of the music. Students will leave clapping and playfully singing “Sa Re Ga Ma” (India’s “Do Re Mi”) or the spoken “bols” / rhythmic patterns of the tabla drums. Clean carpet on a riser or presentable floor space and an adequate sound system as needed for the selected performance space. Artists can provide riser &/or sound system for an extra fee. Given a series of days to work with students, the above themes are elaborated upon more fully to engaged the students creatively giving them a greater sense of India’s identity as well as their own. Andrew McLean, a native of New Orleans, has been performing music in New Orleans and beyond since childhood. Andrew’s intuitive musical aesthetic was nurtured early on by jazz guitar great Hank Mackie and later by world music and jazz faculty at both U.C.L.A.’s department of ethnomusicology and the Ali Akbar College of Music including the legendary Ustad Ali Akbar Khan, Pandit Swapan Chaudhuri and Ustad Zakir Hussain as well as Gerald Wilson, Francisco Aguabella and others. Playing both guitar and Indian tabla drums, he co-founded the Indo-New Orleans group Shringar with New Orleans saxophonist Tim Green and Ustad Ali Akbar Khan’s eldest son, Aashish Khan. Being a pioneer of Indian music in New Orleans, he has performed in the New Orleans Jazz and Heritage Festival, recorded in the top local studios, and collaborated with many world-class musicians including New Orleans piano maestro Henry Butler, Michael Ray, Jason Marsalis, Harold Brown, Tony Dagradi, James Singleton, Stephen Masakowski and local “Mardi Gras Indian” Chief Smiley Ricks among others.He also composed music for film including soundtrack for the PBS-aired documentary Time and Tide as well as “Just Breathe” which was featured in one of Oprah Winfrey’s “Super Soul Sunday” episodes on mindfulness with Jon Kabat-Zinn.